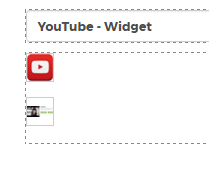 A YouTube Widget allows for easily inserting a YouTube video to a Kentico page. Use either the YouTube widget or one of the 4 multiple-task widgets. Find your video and copy a section of the embed code: click on Share, and Embed. Copy only the code found within the src="" area. If using the YouTube widget, paste the code into url box found within the Kentico Widget. Save and Close. Preview the page. The examples below show both styles of an embedded YouTube video on a Kentico page.